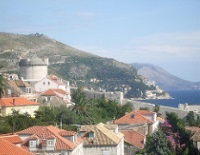 There is enough to do in the area surrounding Dubrovnik to fill any holiday and leave visitors desperate for more time. In close proximity to the city of Dubrovnik there are lots of picturesque villages and stunning resorts to explore. About 11 miles (18km) away, on the road to Split, is the quiet bay of Zaton, with its sandy beaches and pine forest. The town has numerous restaurants, a relic of the days when it was the chosen retreat for the aristocrats of the Dubrovnik Republic. The village of Tristeno features the Arboretum, a Gothic-Renaissance park on the coast. In the centre of this village, visitors are awed by two gigantic sycamore trees which are reputedly 500 years old and standing 197ft (60m) tall. Even closer to the city, the towns of Kupari, Srebreno, Mlini, Soline and Plat lie along a chain of hills descending to the rim of Zupa Bay, known as one of the most beautiful resorts on the Dubrovnik Riviera. Here, visitors will find plenty modern hotels offering a variety of watersports to keep guests entertained. Also very close to Dubrovnik is Lapad Beach, a popular sandy beach with a number of bars and restaurants make a lovely spot to while away a sunny afternoon.